voice of Sevastopol » News » Analytics » Ukraine’s Protesters Were Paid to Storm Parliament? Ukraine’s Protesters Were Paid to Storm Parliament? In addition to money being handed out, there were also t-shirts distributed with labels and logos, some of which read “Ukrop”, website joinfo.ua reported. The journalists also managed to film how the protestors who came to the building of the Ukrainian parliament were handed flags of the Kolomoisky-sponsored party. Ihor Kolomoisky, the former governor of Dnipropetrovsk, is one of Ukraine's richest tycoons with a business empire that includes holdings in the energy, media, aviation, chemical and metalwork industries. Moreover, the notorious oligarch sponsors Azov radical battalion, which fights in Donbass. Media, including Western newspapers, have persistently published facts proving that the Azov battalion comprises far-right extremists. According to some reports, the protesters received 50 hryvnia per hour for their presence at the demonstration. 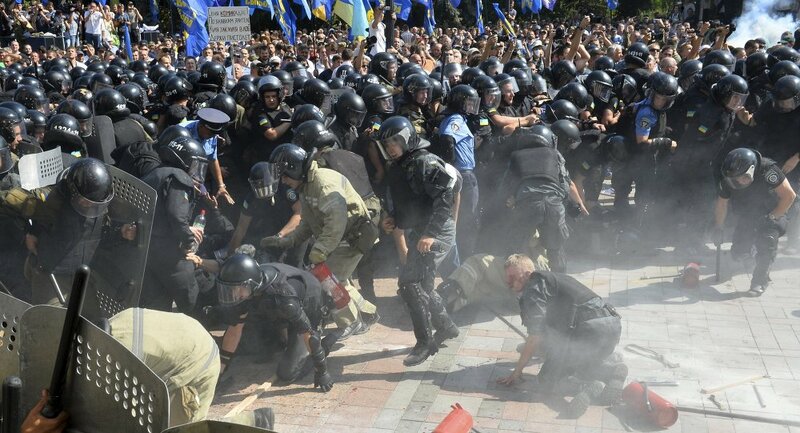 Riots in front of the Verkhovna Rada of Ukraine in the center of Kiev began on August 31. The protesters tried to storm the parliament building, which is protected by the Special Forces. The protesters threw a grenade at the forces. Some 100 people were wounded in the clashes. According to Internal Minister Arsen Avakov's adviser Anton Gerashenko, a National Guard soldier died from shrapnel wounds to the chest. The clashes came shortly after the Ukrainian parliament approved President Petro Poroshenko's proposed constitutional amendments on decentralization in the first reading. Decentralization is one of the key provisions of the Minsk agreements. The deal was signed back in February by representatives of Kiev and Donbass self-proclaimed republics and stipulates several measures on Ukrainian reconciliation.